The mountainous beauty of this classic trail through the Scottish Highlands rivals anywhere in the world. The views are breathtaking and incredibly varied. It’s a wonderful walk which can be completed in six to nine days or in two four day sections. The record for running the trail is an incredible 14 hours, 20 minutes, but we take it at a much more leisurely pace, taking time to savour the beautiful scenery. 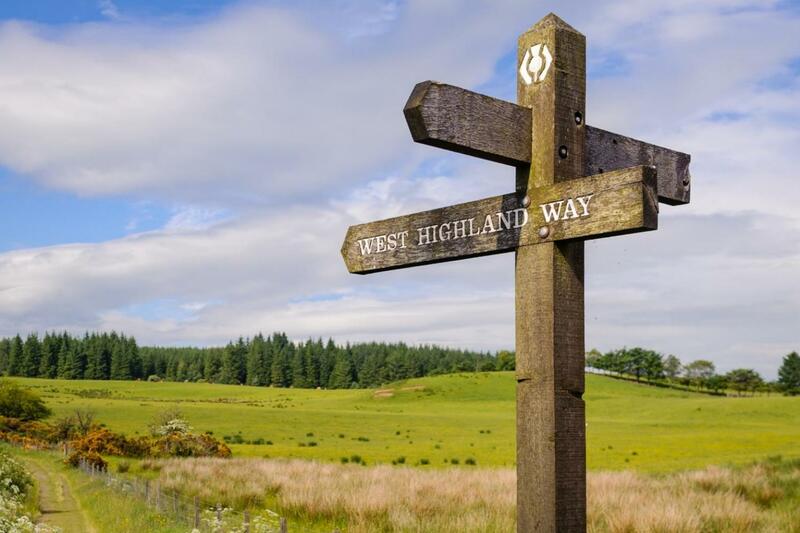 The West Highland Way was Scotland’s first designated long distance trail, but it took nearly 20 years for it to be officially opened from its original conception in the 1960s. It is usually walked from the South to the North, starting in the outskirts of Glasgow and heading past Loch Lomond, the desolate but beautiful Rannoch Moor and the Devils Steps to the finish point in Fort William, in the heart of the Highlands. As you walk, you find the scenery becoming more and more dramatic, culminating in views of Ben Nevis, the highest mountain in Britain. The whole route is well signposted on well-maintained paths, with much of the trail on ancient roads. There’s even a section which follows an old Drover’s road. For the majority of the walk, you’re never very far from a settlement, but some of the wilder sections, particularly over Rannoch Moor and the Devil’s Staircase can feel quite remote. By road: Milngavie is located 25 minutes to the North of Glasgow. There is free parking available for the duration of the trip outside the station in Milngavie or in front of the Police Station. By public transport: Glasgow is well served by train services from all parts of the UK. From the centre of Glasgow [GLC] there is a regular train service to Milngavie Station [MLN] at the start of the West Highland Way, which takes around 25 minutes. Check travelline.info for the latest public transport information. By air: The nearest airport is Glasgow International [GLA], from where you can take one of the regular airport shuttles into the centre of Glasgow (20 minutes). From here, take a train from either Glasgow Central Station or Glasgow Queen Street Station to Milngavie Station (25 minutes). Check travelline.info for the latest public transport information. There are also excellent public transport links from Edinburgh Airport (EDI]. Take the AIR coach direct from the airport to Buchannan Street Bus Station in the centre of Glasgow (1 hour) and then there is a short walk from the bus station to Queen Street Station, where you catch the train to Milngavie (25 minutes). To get back to your car: To return to your car in Milngavie, take the train or bus from Fort William to Glasgow Queen Street and change for a train to Milngavie Station. The journey takes approximately 4 hours. By road: Fort William is located on the A82 on the banks of Loch Linnhe 2½ hours north of Glasgow. By public transport: There is a public bus or train service from Fort William Station to Glasgow which takes around 3½ hours. By air: Return to Glasgow via bus or train and take either the airport shuttle to Glasgow Airport or the AIR bus to Edinburgh Airport. Day 2 - Milngavie to Drymen: Arrive in Milngavie (pronounced ‘Mullguy’) Head to the official starting point of the West Highland Way, a grey granite obelisk which stands proudly in Douglas Street and then follow the signposted route along gentle paths through the Mugdock Country Park Estate to Craigallian Loch, where there are surprising views over the Campsie Fells to the North-East. Glencoyne Distillery makes a good stopping place, where you can pop in for a tour and a ‘wee dram’ of the famous whisky. The route then winds past Gartness and down into the attractive village of Drymen, where you’ll find your luggage waiting for you at your accommodation. Day 3 - Drymen to Balmaha: After a pleasant walk through the Garadhba Forest, you have a choice as to whether to take the easier route beside the B837 or to walk to the top of Comic Hill, where your efforts are rewarded by truly spectacular views of Loch Lomond and the Highland Fells. Your bed for the night is in Balmaha, a touristy village on the shores of Loch Lomond, where there are regular boat trips and plenty of places to grab a bite to eat. 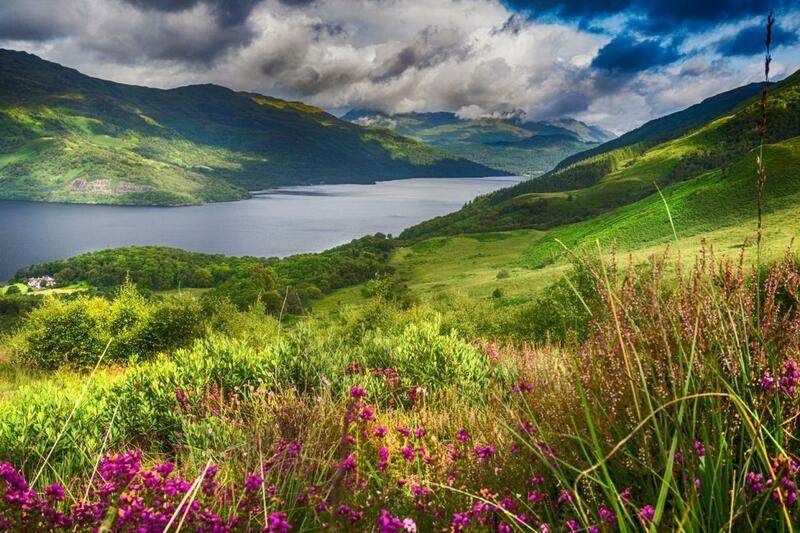 Day 4 - Balmaha to Rowardennan: From Balmaha, it is a lovely gentle walk on the ‘bonnie banks’ of Loch Lomond. The path meanders on the shoreline dipping down to secluded bays and rising up through the native woodland which hugs the shore finishing in the hamlet of Rowardennan. Day 5 - Rowardennan to Inverarnan: Standing on the shore at Rowardennan take a moment to savour the quiet beauty and tranquillity of the loch. The vast lake extends over 23 miles and is dotted with 38 islands, many of which used to be inhabited. To your back towers the majestic Ben Lomond, some 974m above sea level which makes an excellent side trip if you wish to add a free day to your itinerary. The route to Inverarnan takes you along a forest track passing many waterfalls gushing down from the mountain and yields glorious glimpses of the loch through the trees. For the more adventurous, a challenging alternative route hugs the shore, but beware, it is very slow going. At Inversnaid, you enter the RSPB’s nature reserve. This ancient oak woodland is home to a wide array of wildlife including redstarts, red deer and black grouse. You might even encounter a wild goat. The route then climbs away from the loch to Dubh Lochan and down into Glen Falloch, where the scenery changes abruptly to the craggy hillsides and mountain streams of the uplands. Day 6 - Inverarnan to Tyndrum: Heading up Glen Falloch, the trail overlooks the wide river passing tumbling rapids and sheep pastures to the Falls of Falloch (quite difficult to see from the trail) and onwards to the busy village of Crianlarich – the half way point of the trail. From the village, you walk up through woodland, where you get good views of two great mountains, Ben More and Stob Binnein, before heading down to the River Filla and the interesting remains of St Fillian’s Priory. It’s then a pleasant walk along the valley past evidence of the area’s lead mining heritage and through glades of native trees to the tiny village of Tyndrum, a traditional stopping place for travellers heading to Oban and Fort William. Day 7 - Tyndrum to Inveroran: The valley narrows considerably northwards as you walk beneath great majestic mountains with views straight ahead of one particularly impressively shaped mountain, Beinn Dorain. The railway is a companion to Bridge of Orchy, where you leave the valley and enjoy a lovely walk up to the top of a small ridge, where you get to see an incredible view over Loch Tulla, Black Mount and Rannoch Moor (tomorrow’s walk). Then, there is a short descent down to Inveroran and your accommodation for the night. Day 8 - Inveroran to Kingshouse: A superb day’s walking awaits you today, as you head up and over the beautiful and remote Rannoch Moor. This wild expanse is designated a SSSI (Site of Special Scientific Interest) and has inspired many authors and poets. 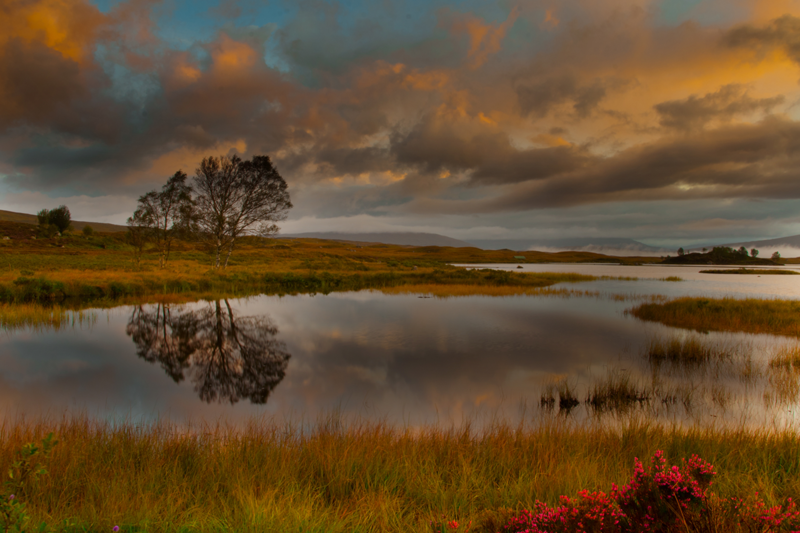 Dotted with innumerable lochans (small boggy pools), the plateau rises to around 500m (1,650ft) and is surrounded by mountains. Leaving Inveroran, the trail ascends Black Mount, an expanse of high moorland and crosses over Rannoch Moor, climbing to 445m (1,460ft). Be prepared on this section of the route. It is a good clear route across the moor, but the weather can change rapidly and it’s not the place to get caught out. 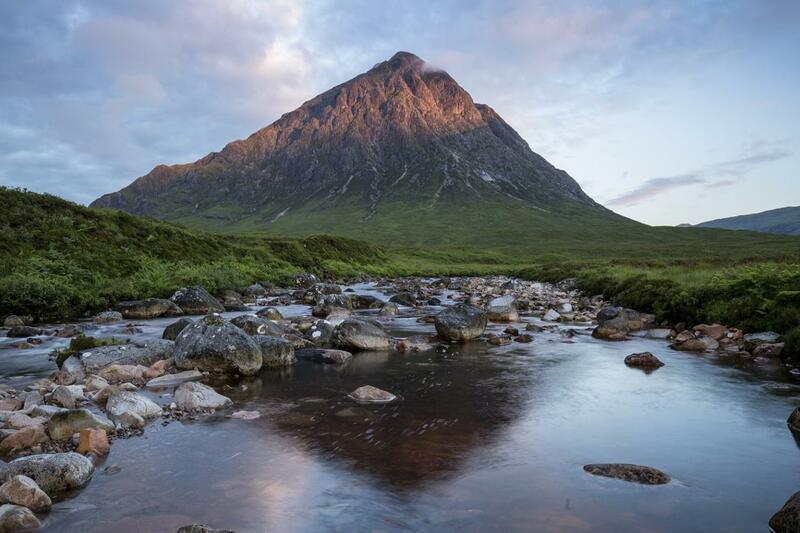 The route then descends gently past the Glencoe ski station and down to the Kingshouse Hotel, perched beneath the stunning Buachaille Etive Mor. 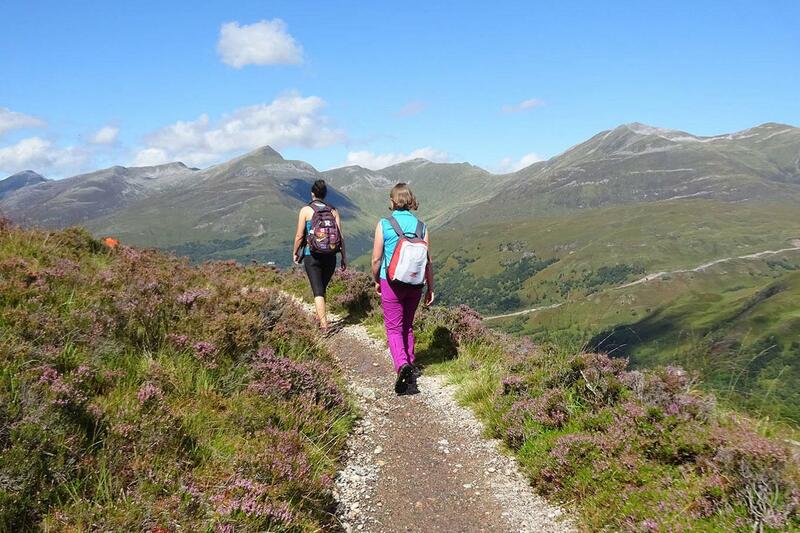 Day 9 - Kingshouse to Kinlochleven: Today’s walk includes the highest point on the walk – the top of the Devil’s Staircase. It is a daunting name, but the reality is actually a fairly straight forward walk up to 548m (1,800ft). Your efforts are rewarded with glorious views over the Mamores and Ben Nevis peeping behind. It’s then a gentle descent down to Kinlochleven at sea level across the rugged mountainside amidst stunning Highland scenery. Day 10 - Kinlochleven to Fort William: Leaving the hustle of Kinlochleven, our final day’s walk has a mix of regret that the walk is nearly over and anticipation to reach the end. It’s a tough, but rewarding day to finish with some of the best scenery the Scottish Highlands have to offer. 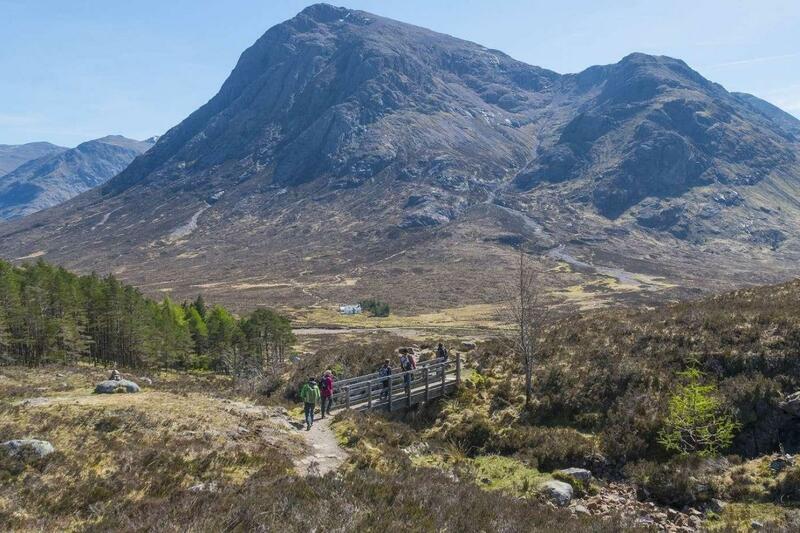 Starting with a steep ascent out of Kinlochleven, the trail levels off ascending gently with wonderful views over Loch Leven as you climb up to the top of the Lairigmor Pass. To your right are the Mamores, a ridge of mountains approximately 15km in length and rising steeply on the far side of the loch is the Aonach Eagach, one of the most challenging ridges in Great Britain. After the pass, it’s a gentle walk down beside a cascading mountain stream to a conifer plantation. The final leg takes you through Nevis Forest and into Glen Nevis, where you get glimpses of Ben Nevis standing 1344m (4,406ft) above sea level, with a final push into the centre of Fort William, ready for a celebratory drink.